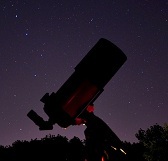 Image credit & copyright: Jia-Hao. Today, Sunday, February 26, 2017 the new moon will cross directly in front of the sun and create the first of two solar eclipses (syzygy’s) of 2017. If you plan to witness one of the most incredible natural phenomenon that the universe has on offer, you will likely have to do some heavy traveling; at least for this event anyway. It may sound cliché but do not look at solar eclipses (or the Sun in general) without eye protection that’s designed for looking at the Sun. Anything other than this may result in permanent eye damage to you or a loved one. If you need to know where to get them check these links or ask me. You can get a pack of 25 for just over $25 (If you’re paying much more than that you’re being ripped off IMO.) so no excuses! Eclipse Glasses – Charlie Bates Solar Astronomy Project – Non Profit Educational Outreach. We'll Donate a Percentage of the Sale Back to The Charlie Bates Project. The Path of Totality (where you can see the total eclipse) is set to begin a couple thousand miles west of Chile out in the Pacific at about 13:15 UTC. It will then cross the tip of South America and the Atlantic before totality disappears about half way across South Africa at 16:31 UTC. The 45 mile (72 km) wide and 8,500 mile (13,700 km) long Path of Totality will make landfall in Chile, Argentina, Angola, Zambia and DR Congo however; a partial solar eclipse will be seen for many hundreds of miles to either side of the Path of Totality. There will be different gradations of partial eclipse visible to you depending on where you’re located. The closer you are to totality, the greater the partial eclipse will be. Conversely, the further from totality you are the less partial the eclipse will be until you get further enough away that you won’t see any. That being said, unless you’re in South America, South Africa or parts of Antarctica the only way you will be able to see this eclipse is after the event in images which should be spectacular and or watch live feeds of the event which I provide below. What’s a “Ring of Fire” Annular Solar Eclipse? A solar eclipse is when the Moon passes in front of the Sun, blocking out much of the Sun’s light. For accountability, I will also add that a lunar eclipse is when the Earth gets between the Sun and Moon, preventing much of the Sun’s light from reaching the Moon. These events happen because the Moon is 400 times smaller than the Sun but the Sun is 400 times further away than the Moon is. This is all pretty simple as a concept but it comes in varying degrees. You have total solar and lunar eclipses which is when the three bodies are lined up nearly perfectly so that most of the Sun’s light gets blocked. You also have partial eclipses and those are solar and lunar eclipses when the alignment of the three bodies isn’t spot on. In this particular case we will be having a total solar eclipse but the Moon will be slightly too far away in its orbit to oblige a completely covered solar disk. This creates the beautiful annular or “Ring of Fire” total solar eclipse. As Johannes Kepler discovered a long time ago, orbits are not circular, they’re elliptical or slightly oval. In the Moon’s case, its average distance (semi-major axis) from Earth is about 238,000 miles (382,900 km) but also during each cycle is has times when it’s closer (perigee) and further (apogee) from Earth. Let’s look at the extremes using this year as an example. The Moon will get as close as 221,958 miles (357,207 km) during perigee on May 26 and it will be as far away as 252,651 miles (406,603 km) during apogee on December 19. That’s a difference of more than 30,693 miles (49,395 km). During Sunday’s eclipse, the Moon will be 235,010 miles (378,211 km) from Earth which means is will be slightly too small on the sky to completely cover the Sun. In fact it will only be about 570 miles (917 km) too far away for the umbra to reach Earth which would equate to a fully covered Sun. 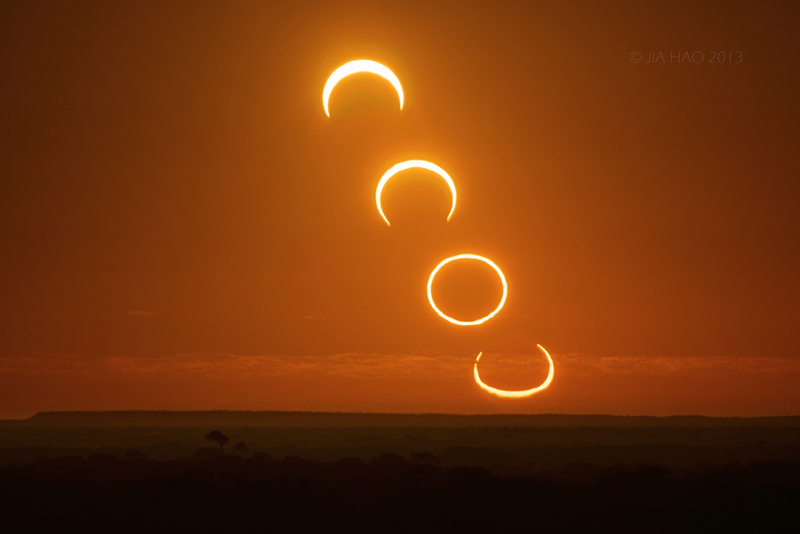 Image | This entry was posted in Astronomical Events, Astronomy (Learning), Eclipses (Solar & Lunar), Images, News, Solar System and tagged Annular Eclipse, Annular Solar Eclipse, Astronomy, Astrophotography, DanSpace77, Eclipse, Eclipse 2017, Eclipse2017, Jia Hao, Moon, Solar Eclipse, Solar System, Sun, Total Solar Eclipse. Bookmark the permalink.